The Centre for Emotional Health at Macquarie University has been awarded $1.8 million in funding from the National Health and Medical Research Council (NHMRC) and beyondblue for two innovative projects to improve treatment for older adults with depression and anxiety. 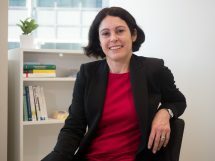 Associate Professor Viviana Wuthrich will lead a project in conjunction with UNSW, VU University Amsterdam and Western NSW Local Health District to trial internet or phone-based therapy options for older adults who may not require or be able to access a more intensive face-to-face mental health treatment program. This is the first time a ‘stepped’ approach has been trialled in Australia for treating older adults with depression or anxiety. Associate Professor Wuthrich said the project has the potential to lead to a more efficient and effective approach to mental health treatment. The four-year trial will take place in five locations in Sydney and the western NSW local health district (Dubbo, Bathurst, Orange). A second project led by Distinguished Professor Ron Rapee and Associate Professor Wuthrich will trial a combination of cognitive-behavioural therapy and social engagement activities on mental health outcomes for older adults. This project is being run in conjunction with researchers from UNSW and USyd. “This is an exciting new direction to potentially compound the benefits of traditional mental health treatment,” said Associate Professor Wuthrich. “Loneliness has strong negative health impacts, and social interaction is vital for good mental health and brain functioning throughout the lifespan. In announcing the research grants, Minister for Health Greg Hunt said older people are particularly vulnerable to developing mental health conditions such as depression and anxiety, and that’s exacerbated by declining physical health, chronic pain, loneliness, grief and loss of independence. “10 to 15 per cent of older adults in Australia experience depression, but for people living in residential aged the rate is much higher – around 30 per cent,” Minister Hunt said.